In 2017, there were 8.4 billion connected devices and the volume is expected to hit 20.4 billion by 2020, according to analyst firm Gartner. Hackers prefer to go after the weak link in the security chain and it doesn’t take much to hack into the Wi-Fi network using easily accessible tools and a plethora of online how-to videos. Even the most rookie hacker can intercept traffic flowing over Wi-Fi and steal valuable data from your smartphone, tablet, smartwatch, or laptop. 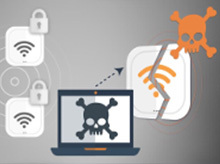 What’s worse - your business networks become compromised due to malware implanted and credentials stolen over Wi-Fi, and it can cost millions in fines and breach remediation expenses to fix. Market-Leading Performance: You should never be forced to compromise security to achieve the necessary performance to support your environment with the speed, connections and client density that it needs. Scalable Management: With easy set-up and management, you should be able to control your entire wireless network from a single interface and execute key processes to safeguard the environment and its users. Join the Trusted Wireless Environment Movement. WatchGuard’s Secure Wi-Fi Solution is engineered to provide a safe, protected airspace for your Wi-Fi environments, while eliminating administrative headaches and greatly reducing costs. With expansive engagement tools and visibility into business analytics, it delivers the competitive advantage your business needs to succeed.